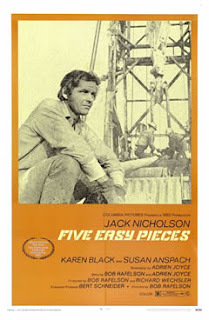 Tag line: "He Rode The Fast Lane On The Road To Nowhere"
Everybody has their own way of dealing with pressure, but for Bobby Dupea, Jack Nicholson’s character in Bob Rafelson’s 1970 film, Five Easy Pieces, stress isn't really an issue. That's because he’s usually two steps ahead of it at all times. In fact, Bobby’s been avoiding his worries for so long that he’s become a pro at ignoring not only life's anxieties, but its responsibilities as well. As the movie opens, Bobby is working as an oil rigger, and spends his nights bowling with his waitress girlfriend, Rayette (Karen Black), and best friend, Elton (Billy Bush). It’s a typical blue-collar existence, yet Bobby doesn’t come from a blue-collar background. Truth is, his family is very well off, and he was quite the accomplished pianist in his younger days. After paying a surprise visit to his sister, Tita (Lois Smith), Bobby learns his father is critically ill, and decides to return home for a while. Once there, he continually mocks his brother, Carl (Ralph White), a violinist who suffered a rather bizarre neck injury, and tries to seduce Carl’s fiancée, Catherine (Susan Anspach). But when Rayette arrives unannounced at the Dupea family estate, the sudden collision of his two worlds is more than Bobby can stand. The most interesting aspect of Five Easy Pieces is how it addresses the dual nature of its lead character. In the film's early scenes, where we watch Bobby working at the oil rig and interacting at home with Rayette, never once do we get a hint of his prestigious background. He keeps this a secret from those around him not because he's ashamed, but because Bobby likes to hide from his problems and responsibilities. He didn't so much turn his back on his family as he did the pressures of being part of it, the expectations that went hand-in-hand with his impressive musical talents. Yet it seems life caught up with Bobby, even way out in the oil fields. When Elton informs him Rayette is pregnant, Bobby is unable to cope with the news, and uses it as an excuse to seek out his estranged sister, attempting to escape his current drama by re-introducing himself to the past. Unfortunately, Bobby still isn’t very comfortable at home, either, and for the first time, finds he has nowhere to run. And yet, despite his obvious fears of commitment, Bobby Dupea remains an enigma throughout the movie, an incredibly intelligent man who chooses to hide in plain sight from those around him. It's to the filmmakers credit that Five Easy Pieces provides just enough information about Bobby Dupea for us to get to know him, but not nearly enough to figure him out.